Neuromarketing – Consumer’s Mind And A Firm’s Strategy | Business Article | MBA Skool-Study.Learn.Share. In today’s competitive market, firms are trying to woo the customers by different means. In contemporary times, the challenges faced by Marketers are increasing day by day. Marketers are trying to reach out to their customers and the key is getting your customers before your competitor’s do. Mr. G.K. Chesterton has famously quoted “I am not absentminded. It is the presence of mind that makes me unaware of everything else.”(Source: http://www.goodreads.com/quotes/show/23382). This shows the importance of human mind and the plethora of information which is stored in it. People themselves are unaware how they are perceiving things and what brain activities are working behind it, which either makes them like a certain product , advertisements etc. or not. NeuroMarketing is one such way which enables a firm to dig deep into a customer’s mind. Once a Marketer is able to read a customer mind, he is in a better position to place his product according to the customer perceived value of the product. ‘Neuro’ means related to nerves. ‘NeuroMarketing’ is a type of marketing in which brain activities of a respondent is captured when they are exposed to a given external stimulus. E.g. Showing an advertisement to a person and noting down the activity of his brain. Different parts of brain respond to the different information it receives from an external environment. Scientists have mapping technologies which enables them to take images of any brain activities that occur in a part of brain while a respondent is exposed to an external stimulus (e.g. activities of brain while watching an advertisement). Some of the instruments using mapping technologies are positron emission tomography (PET), Magnetoencephalography (MEG), Functional Magnetic Resonance Imaging (FMRI), Electroencephalography (EEG) etc. By Drive theory, we can see how Needs of an individual first develops, coupled with drives and once drive is developed then an appropriate goal must be chosen for the reduction of drive. With the help of NeuroMarketing, Marketer knows what are the key parameters (e.g. advertising, promotions, and packaging) which arises the drives (e.g. longing for a particular product) and in what form incentives (e.g. providing product) can be provided to the customer so that there is reduction of that particular drive. If a Marketer understands the whole cycle, it will be much easier for him to provide products according to the needs and wants of the customer. In hindsight, NeuroMarketing is a method to know the demand of customers both extrinsic as well as intrinsic. It is a contemporary method to identify customer requirements. Knowing a customer needs and wants and acting on it will lead to increase dividends for a firm and it will help a firm to stay ahead of its competitors and hold sizeable market share in a long run. Use of pupil movement to know customer preference was used by Coca Cola in 1960’s to gain customer insights and preferences (Source: http://www.sutherlandsurvey.com/Column_pages/Neuromarketing_whats_it_all_about.htm). Indeed it gave Coca Cola remarkable insights about how customers perceived the drink, but with the advent of superior technologies, Marketers now have a promising opportunity to know more about their customers. In NeuroMarketing, technology such as FMRI is used which is attached to the person undergoing the test. Now, certain visuals like advertisements, photos or pictures depicting a brand are shown. As the person is viewing, the instrument (e.g. fMRI) keeps on recording the brain activities of a person and also the part of brain which is being stimulated in response to a particular advertisement. It has been established by Scientific Community that a human brain has different centers – price center, recognition center, achievement center etc. So, if a Marketer knows that in response to a particular advertisement of its product, certain part of the brain center is activated then he will be in a better position to know how his product is being perceived by person in general. Knowing a customer perception and values regarding a particular product can enable a Marketer in different ways - setting an appropriate price (e.g. Rs 499 may be perceived in more favorable manner than Rs 500), positioning of product (e.g. a high end product or a low end product), ascertaining whether the intended message of a product is being delivered appropriately and effectively to the target audience. In near future, the use of NeuroMarketing may form core strategy of firm to gain sustainable competitive advantage over their competitor’s. Firms will look to use it extensively for gaining customer insight so that they are in a better position to place their product. The firms using this sort of marketing as a core strategy will have an upper hand over their competitor as they will be placing their product in the best possible manner and will have strategies to attract the targeted customer segment. 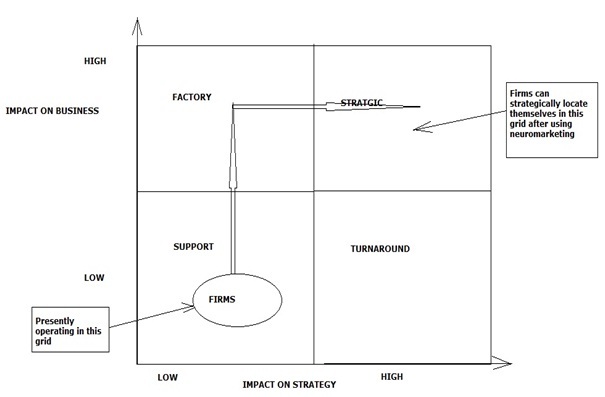 We can see by McFarlan’s Strategic grid how firms can use NeuroMarketing and the technology behind it to place itself in Strategic Grid in which NeuroMarketing will form its core strategy having high impact on its business operations and strategy. SOURCE: Corporate Information Strategy and Management by Lyanda M Applegate, Robert D Austin and F Warren McFarla. Having known the outcome and results that different technology can provide us. It now becomes imperative for a Marketer to know what all can be done with the plethora of information NeuroMarketing is providing. The ability of a marketer to comprehend the data and use it judiciously and effectively is a prime concern regarding the use of such technologies in Marketing. The other moot point which challenges this sort of Marketing is the issue of ethics. Question may arise on the intent of firms using NeuroMarketing. The firms can use the test results to their advantage by exploiting the buying behavior of an individual. This is possible as the firms will be constantly providing information to that part of consumer brain centre which will propel him to purchase a product. There is not an iota of doubt that NeuroMarketing will be a core part of Marketing in the years ahead. But the success of it is only possible when Marketers fully understand the data and the results obtained by various test performed. Also, getting tons of data’s and results can be of no use if they are not properly understood and implied in a useful manner. So , a marketer while working with the test results should have a clear understanding in his mind as to what all objectives is required to be fulfilled with the test . Adding to this, marketers should try to quantify the data obtained from the tests so that they can be easily measured. Scientists and Researchers should look to build a mathematical model based on test results , so that once a data is obtained ,it can be successfully used to predict and identify different variables affecting the consumer behavior. This article has been authored by Divyanshu and Kaushal Kishore from TAPMI.